The aureole that surrounds the western and northern sectors of Olympus Mons has puzzled Mars geologists. The most common idea is that these deposits formed as giant land slides as the volcano partially collapsed under its own weight. This HiRISE image ( PSP_003450_1975 ) is centered on a dark and relatively dust-free part of the aureole. Where the dust has been stripped off, swirling bands of darker and lighter rocks are visibile. These suggest gently warped layers that have been exposed by erosion. 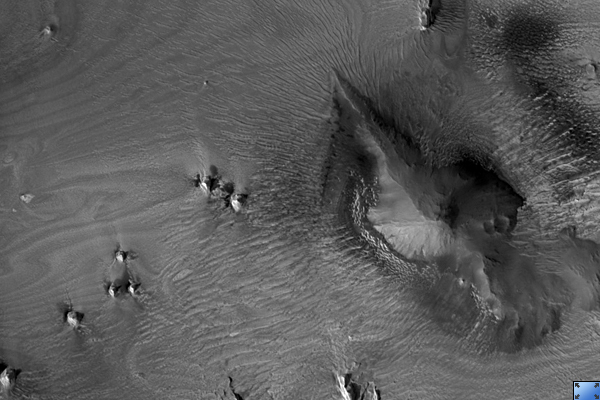 In fact, many of the small pinnacles and mesas in this area are being eroded by the wind in the same way as layered deposits in other parts of Mars. However, there are also blocks that shed dark material, that could be broken up lava rock. The many dunes in the area suggest that much of the debris is sand sized.